Saturday: Partly cloudy, afternoon storms. Muggy. Highs in the 80s. Saturday Night: Partly cloudy. lows in the 60s. Sunday: Mostly sunny. Highs in the 80s. 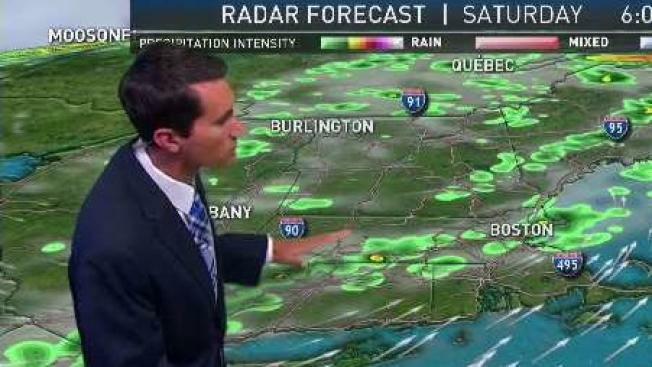 After yesterday’s storms and downpours, we’re staring at another day with volatile weather. Sticky air will fuel the storms as a cool front swings in from the west. First up is Western New England in the late morning and early afternoon. Some storms may be strong to severe as the line progresses to Central New England by mid-afternoon. Finally, the front crosses into Eastern New England by the evening. "Oh no," you say. "I have tickets to the NKOTB concert at Fenway!" Fret not, the storms will be hit & miss, and they're likely to be passing. So if you're unlucky enough to get a storm, “hang tough”. As the night progresses, the storms will all end and you should be in the clear for the trek back to the car. Sunday is screaming beach day with a drying west/northwest wind and a ton of sun. Lingering warmth will give us a chance to hit the mid-80s again. Chance for a sprinkle across Northern Vermont in the afternoon, otherwise we are dry and bright. We'll see-saw back and forth with the humidity early next week before a definitive cool front pushes through Tuesday and sends us into a beautiful stretch of sunny weather.